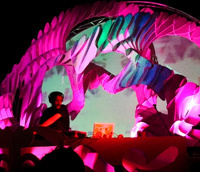 The Tipper Sound Experience takes over the Coconut Grove ballroom in Santa Cruz for a night of mayham. The 4 quadraphonic Funktion One stacks sounded perfectly crisp and tremendously heavy inside the century old historic dome. This was the only stop of the tour where all Led hardware was set up as freestanding structures including the 4 complete cubes. A VIP balcony area gave the perfect vantage point to soak up the sold out show. Opening sets by Little John and Vibesquad.